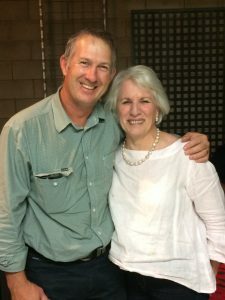 Jill Murray had been Carrick Aland’s Receptionist in Dalby office since 2005, a role which was totally different from anything she had done previously. Prior to joining our team, Jill had promoted our local Chamber of Commerce and also worked in the advertising department of a local newspaper, both which she thoroughly enjoyed, but once she settled into Carrick Aland’s reception, she realised just how much she enjoyed interacting with people. Testament to this is when Dalby client, John Alexa, came in to personally farewell Jill on her last day with flowers and chocolates (main photo). Now officially retired, Jill looks forward to gardening, cooking and being with her family, especially her six grandchildren. Jill calls her husband Ross her greatest supporter and together they have a love of theatre, musicals and travelling which we’re sure they’ll continue to pursue. At Carrick Aland we thank Jill for her dedication to looking after our clients for 13 years and warmly wish her the very best for retirement and in all her future endeavours.